"It Ain't About the Money"
FLASHBACK MODE – just for context. I was offered a position back in October of 2016 that I was anxious and incredibly honored to receive. Due to my experience writing influencer programs and strategies for a former agency’s clients as well as my own Blend clients, I was offered the opportunity to write programs, strategies and campaigns for Fortune 1000 clients (such as OREO). I was elated, honored and frankly, it was a really proud moment for me to have stepped into a more prestigious opportunity that I felt I earned and deserved through 5+ years of career dedication. I didn’t realize when I accepted, that I would also be responsible for any and all sales and quarterly quotas. I thought about leaving the position, but – that would have been giving up too easily. With every step in a new direction and a higher rung on the “corporate ladder” comes new challenges and new skills you must master to succeed. Plus, I had what I believed to be the best network of friends in sales a girl could have, and I thought of this as a new opportunity to learn from the “masters”. And after 6 months, I had learned some very valuable life skills just for trying. As part of my goals set forth in late 2017 – I wanted to improve my ability to hit my sales quotas. I wanted to BE a better sales person. I wanted to sign more deals, hit above each of my targets – I wanted the extra cash. I wanted to improve my bottom line, but moreso, this was communicated to me as how I could help improve the company’s growth. This was how I could contribute – and I wanted to fulfill that obligation. So I made a plan to get there. More calls, more proactive outreach, more aggressive outreach, better consulting. More organized structure to my day could lead to better productivity – and more focus on the programs I was creating would lead to more thorough and creative ideas. I bought a headset to motivate me to spend more time on the phone and less on email. But I was still hitting walls. I had developed over 30+ strategies for companies. Many lately – haven’t even been answering or responding to emails upon delivery. Despite my best efforts – nothing has changed. I have not allowed this to bring me down (in fact, I keep trying. This is not something I want to give up on.) I let it inspire me to look back through the relationships I forged with potential leads and clients over the past few months and see if I can find a pattern between the things I did succeed with – and the things I did not. I found there are two types of clients – clients know what they want, and clients who are willing to admit that they don’t know what they want. Likewise, there are two pathways to create a service sale – you can give a client what they want or you can consult a client on what they need. Two different pathways. 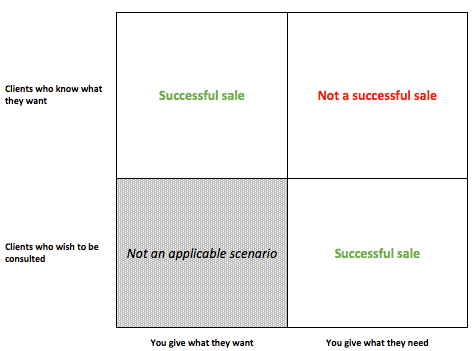 Success is kind of ends up looking kind of like a prisoner’s dilemma. As per this scenario – I was missing out on almost 33% of possible sales that would have increased my ability to sign deals and contribute to the bottom line. The easy fix, is that when dealing a client who knows what they want – that you give them exactly what they want. If you spell success as signing the deal, getting the money, increasing the bottom line of the company and padding the inside of your pockets – then enacting this solution is easy. If a client comes to you with what they want, simply give it to them, regardless of whether you know it will be effective. And that’s where the trip up is. It’s morality, but furthermore, it’s about the force that is driving the sales person. If you have the ability to prioritize the sale, the final outcome, the signature, and the deal, its incredibly easy to give a client what they say they want, regardless of whether you know it will give them the actual result they are looking for. Is this morally wrong? Not at all – actually, it shows a passion and dedication to furthering the bottom line of your company. Maybe it’s about having the ability to pay your people and not have to lay them off – you will do whatever you have to prioritize the bottom line and growth of the company and that’s completely okay. This is a driving factor for many levels of management, owners and operators with a vested stake in the income and profitability of a certain company or corporation. But as a sales person – it’s not what drives me. I do not feel like I did my job in using my services or my company’s services to help grow your brand, if the strategy that I develop – does not help grow your brand or give the results you are looking for. I’m driven by my ability to make an impact (how millennial of me) by providing value – and where I struggle is providing strategies or campaigns that I know may be what a client is expecting – but offer no real value to the company. But not every client wants you to give them “what they need”. Consider this scenario on public health and weight loss: Doctors and weight loss specialist and the overwhelming majority of “experts” with no vested interest in your MONEY, but instead a vested interest in your health, wellbeing and longevity – have agreed that proper nutrition, diet and exercise are the key drivers in weight loss. So, if that’s the honest truth, why do weight loss supplements exist? If someone picks up a bottle in YOUR health food store and asks if this will help them lose weight – do you respond “yes!” to make the sale? Or do you say “well, not if you don’t also enact proper diet and exercise”. Most workers will do the former, not the latter. Is this the truth? Well, kind of. It’s omitting the truth. Weightloss supplements are designed with key ingredients studied to aid in weight loss – but a user of said product will not reach their ultimate goal of losing weight unless they enact proper nutrition, diet and exercise along with the supplement. Some consumers want to hear honesty. And some are intelligent enough to understand the truthful “science” behind the product, how it works – and what they can and SHOULD expect from the product. Put this in the box above. If you are speaking to a client who wants a weightloss pill, but does not want to exercise or diet – then telling them what they “need” (that they won’t reach their goals with the pill) will not make the sale. If you are speaking with a client who wants to be consulted, and you tell them what they need, not only will you make the sale, but that consumers also have a better chance of reaching their goals of actual weightloss. Or you could just say “yes this will help you lose weight” omit the details. Consultative selling has been linked to have better long-term payoffs – imagine, now that you have gained the trust of the consumer and have helped them succeed at their goal – you set yourself up for potential long-term business opportunities. But it could also cause you to lose out on the sale. Lying or omitting the truth, has made you the sale – but cost you repeat business. The client has to trust in your ability to be an “expert” on something in order for you to make that sale – but sometimes, the clients want to be the “expert” and hire you for the help. That’s the nature of the beast in selling services and responding to leads. Despite all the successful leaders that preach the way to increase revenue is through honesty, integrity and other morally-driven objectives – these focuses don’t always bring the short-term gains executives and investors need to see. Though risky from a reputation standpoint, omitting the truth will sometimes create the shorterm gains and sales that allow you the freedom to not have to rely on repeat business. Repeat business is not every corporation’s goals. For me, “it ain’t about the money.” But, that’s what my job success as a Sales / Strategy Director is measured on. In this case, I have some choices to make – or I some “recontexualizing” to do to find a solution so that this does not become a barrier for me to reach my short-term goals. But – I do believe it’s possible. For any sales pros – what are your thoughts on this pull? Do you prioritize morals or bottom-line? Do you sit somewhere in between? How do you balance the needs?